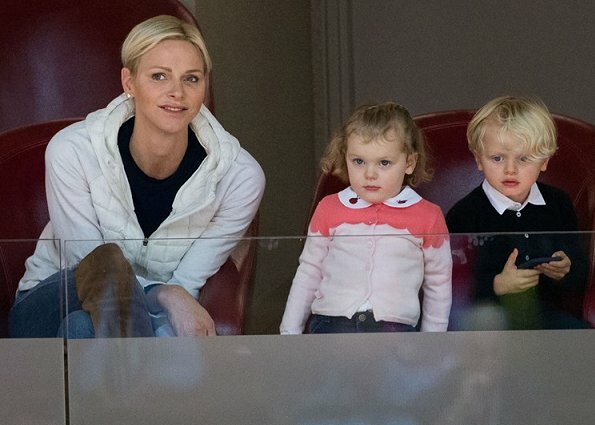 In the afternoon of December 2, Saturday, Princess Charlene, Crown Prince Jacques and Princess Gabriella of Monaco came to Gaston Medecin Indoor Sports Hall of Louis II Stadium to support A.S. Monaco Basketball team playing a match with Chalon-sur Saône team in France LNB Pro A group. As Monaco won the match by 87-57. Lovely and relaxed mother on these pictures, I like her in this role! Charlene involoves her children in engagements and especially shows topics which are important for her for example rugby. Charlene looks like her former self her. Nice to see her more natural. Gabriella reminds me of Stephanie here. And Jacques of 'Rainier. Cute kids and Charlene looks better than for a very long time. wat schattig ze worden zo groot !! !